Five Nights at Freddy’s 3 (dubbed FNAF 3) is the third chapter in one of the scariest survival horror games to hit the Play Store. In this latest installment you play as a new security guard whose job is to monitor the camera feeds to find the monstrous animatronic creature that's trying to kill you...horribly! 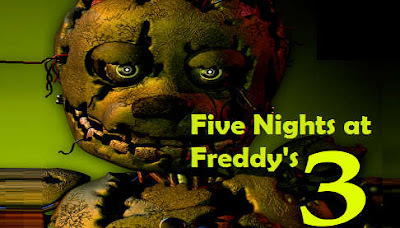 Download and install the full version of Five Nights at Freddy’s 3 APK (v1.0.7 update) for your Android and try to find the terrifyingly deadly bunny called Springtrap. Now for some background: The usual game locale called Freddy Fasbear's Pizza has closed and has been replaced with "Fazbear's Fright The Horror Attraction", a new business trying to exploit the gory legacy of the infamous Fazbear's Pizza restaurant by turning it into an amusement center. FNAF 3 (Apk below) delivers much of the usual scare-fested gameplay experience as its predecessors. The game contains atmosphere, intrigue, and scares that'll appeal to any horror fan out there if it weren't for some gameplay mechanics issues.. to be hopefully fixed in some near update. Several bug fixes and added effects. Install the apk and play offline.